Is Tim the senior partner? 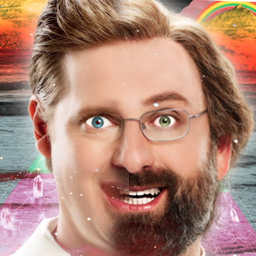 I have watched just about everything I can find that Tim and Eric have made, and I just can't shake the impression that he has just a little bit more importance than Eric in the collaboration. Obviously, Tim gets first billing on everything, but Tim's dad is also the face of Absolutely, and Tim seems to do more on his own comedically while Eric seems to be more interested in music. This is weak too, but the bits where Tim quit because of success with Spagett and Choices: The Problem with Eric Wareheim seemed to follow this theme. Once I started thinking this, it just seems to pop up all over both Awesome Show and Tom Goes to the Mayor that Tim's just a little bit more in the center of things. I may be way off, but does anyone else see this reflected in their work? I think personality-wise Tim seems to ham it up more in the spotlight. Eric seems to be more interested in post-production projects like editing and directing. That's just my take. Yeah, I think Tim is more of an actor than Eric. I definitely think they both are responsible for about 50% of the material on the show, though. Especially if you watch Eric's directed stuff outside of T&E, you can easily parse what parts of awesome show was done by who, it's pretty obvious too. The gross stuff is usually Tim's doing, the weird, distorted faces are Eric's idea, and I'd say they share the acting style (bad pacing, amateur acting, enunciating the wrong words.) Apart they are great, but as a duo it's a fantastic mix of abstract, uncomfortable and surreal. Oh man, thanks for linking this, it's incredible. This. Though no one should underappreciate what an impact douggpound has on editing. this might get some flak, but i've always felt that tim is the funnier performer between the two, but that eric's contribution is more about getting that specific FEEL exactly right as a director. What are some of those things Eric's done? I'm quite interested. O_O He did a music video for Flying Lotus? I am all over that. So hard. Many thanks. Also "Pon de Floor" by Major Lazer ("Keep it going louder" also has Eric's signature style but I don't see an explicit "directed by" credit). While you're at it listen to every flying lotus song ever. Cosmogramma is a brilliant album from begging to end. It's probably the only album I can think of where I like every single song. Check out The Bird And The Bee - Polite Dance Song. Good song, better music video. in the credits, tim's name is clearly in smaller, jokermans font. i have no idea what that could even mean. It means tims a tute man. im having a tough time deciding if id trust a 'tute man, or a man who wears a straw hat inside his home. Actually Eric had the whole idea for Tim and Eric and originally Tim was just some guy named Q. Who is the Number One Handsome Man? May the luck of the Irish smile on ya. At the same time though, Tim always seems to be the 'loser' of the two. He's always the one that's killed, or if there's some kind of competition he's the loser. And the entire Tom Goes to the Mayor. A subreddit dedicated to our favorite duo! The #2 Mod, the Little Man Moderator, in Jokerman Font.